States have many tools at their disposal to suppress their subjects: the military, police, taxes, and laws, to name a few. The extent to which starvation has been used, or became a way to discriminate against, punish or eliminate national, ethnic, racial or religious groups (as described in the UN Genocide Convention) has not always been appreciated. This symposium, co-organized by the Holodomor Research and Education Consortium and the International Institute for Genocide and Human Rights Studies, focuses on four case studies to shed light on the politics of starvation, examining methods, their effectiveness as instruments of government policy, and the devastating effects on target populations. The Irish Famine took place between 1845 and 1852. The Irish population was heavily reliant on potatoes as a food staple, but potato blight destroyed several crops during this period. England’s policies, including those regarding land acquisition, absentee landlords, and the continued export of grain from Ireland, exacerbated the Famine, in which approximately one million people died, with a million more emigrating, causing the island’s population to fall by between 20 and 25 percent. During the First World War, as many as 1.5 million Armenians perished due to the genocidal policies of the Young Turk government of the Ottoman Empire. The Armenians were internally displaced, murdered en masse, or died of thirst, starvation and disease. Those who claim there was no genocide say there was a shortage of food for everyone. A closer examination reveals a deliberate policy of withholding food and deporting the Armenians to where there was no food, water or shelter. The Holodomor, or artificial famine in the Ukrainian Soviet Socialist Republic in 1932 and 1933, killed an estimated 4 million Ukrainians. Soviet policies, including confiscation of grain and household foodstuffs and restrictions on travel from affected areas, led to death rates in Ukraine of 25,000 people per day at the height of the Famine. During this period, Stalin also decimated Ukrainian religious, intellectual and political elites in an effort to quell aspirations for Ukrainian political autonomy. 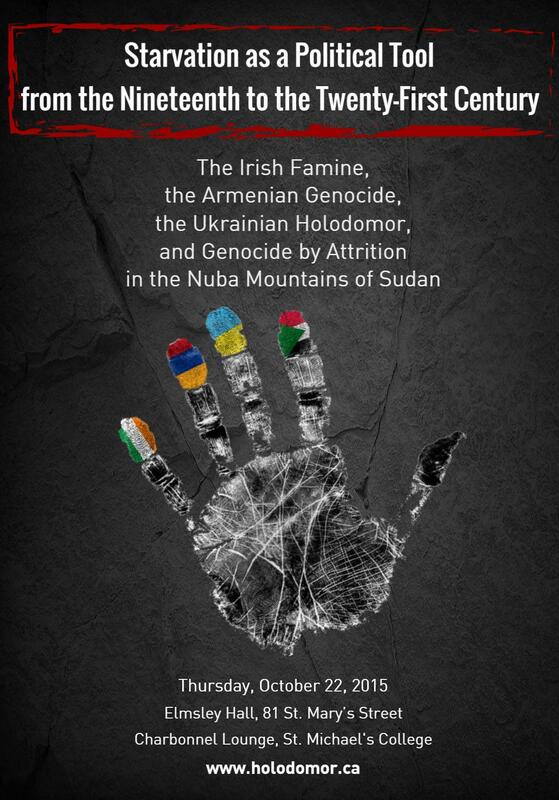 In the late 1980s-1990s, the government of Sudan perpetrated sustained attacks against the people of the Nuba Mountains in the South Kordofan region through aerial bombardment of civilian villages and a genocide by attrition through forced starvation, including blockading humanitarian aid efforts to bring food and medical care into the starving region. These events preceded the current war (2011-present). In some cases, powerful governments willfully acted against civilian minority populations. In others, hunger was intensified by policies directed against specific groups or peoples. The Statute of the International Criminal Court includes the denial of humanitarian assistance as an act that may lead to starvation, and the Geneva Convention prohibits the starvation of civilians as a method of warfare. The United Nations Genocide convention states that “deliberately inflicting on the group conditions of life calculated to bring about its physical destruction in whole or in part” is a genocidal act. What measures have been employed to intervene in cases of forced starvation? What legal instruments and mechanisms are available to the international community? In reviewing these four cases, the symposium will address these questions and other issues of contemporary relevance. Andrea Graziosi, vice president of the Italian Agency for the evaluation of Universities and research, is a professor (on leave) at the Università di Napoli Federico II, an associate of the Centre d’études des mondes russe, caucasien et centre-européen (Paris) and a fellow of Harvard’s Ukrainian Research Institute and Davis Center for Russian and Eurasian Studies. Mark G. McGowan is a professor of history at the University of Toronto and Principal Emeritus at St. Michael’s College. He has written several award-winning books including The Waning of the Green: Catholics, the Irish, and Identity in Toronto, 1887-1922 (1999), Michael Power: the Challenge to Build the Catholic Church on the Canadian Frontier (2005), and Death or Canada: The Irish Famine Migration to Toronto, 1847 (2009). The recipient of four university teaching awards, he has just completed two books: one on Canada’s Irish Catholics and the Great War, and a second, an edited anthology of Irish Catholics in Halifax. Samuel Totten is Professor Emeritus at the University of Arkansas, Fayetteville. In 2008, he served as a Fulbright Scholar at the Centre for Conflict Management at the National University of Rwanda. He continues to conduct field research in the Nuba Mountains, both into the genocide by attrition (1989-mid 1990s) and the current war between the Nuba and the Government of Sudan (2011-today). His most recent book is Genocide by Attrition. Second Edition (New Brunswick, NJ: Transaction Publishers, 2015). George Shirinian is the Executive Director of the Zoryan Institute, based in Toronto, Canada. He is an official of the journal Genocide Studies International and one of the organizers of the annual Genocide and Human Rights University Program, run in partnership with the University of Toronto. He is the author of articles on the Armenian Genocide, co-editor of Studies in Comparative Genocide (Macmillan 1999), editor of The Asia Minor Catastrophe and the Ottoman Greek Genocide: Essays on Asia Minor, Pontos and Eastern Thrace, 1913-1923 (The Asia Minor and Pontos Hellenic Research Center 2012), and a contributor to The Armenian Genocide: The Essential Reference Guide (ABC-CLIO, 2015). His most recent publication is “Ermenileri Kurturan Müsülmanlar: Soykırım Günlerinde Insanlık Arayışı [Muslim Rescuers of Armenians: A Search for Humanity during Genocide], in Ermeni Soykirimi’nda Vicdan Ve Sorumluluk: Kurtulanlara Dair Yeni Arastimalar [Conscience and Responsibility for the Armenian Genocide: The Survivors Regarding New Research] (Instanbul: Hrant Dink Vakfı, 2015). Joyce Apsel Ph.D., J.D. is Master Teacher of Humanities in the Liberal Studies Program of the College of Arts & Sciences at New York University. She is a recipient of the NYU Distinguished Teaching Award (2008-2009). She also held the Stockton College Ida King Chair in Holocaust and Genocide Studies and was a Visiting Professor at the University of Oslo and Research Fellow at H-L Senteret in Oslo, Norway. Dr. Apsel is currently President of the Institute for the Study of Genocide and former President of the International Association of Genocide Scholars (www.iags.org). She has also published a series of articles on genocide, children’s rights, peace museums, and human rights education. Recent articles include: “Darfur: Historic Processes and Regional Dynamics” (Human Rights Review)—a recipient of the 2010 American Sociological Association Outstanding Article Award of the Peace, War and Conflict Section; “Educating a New Generation: The Model of the Genocide & Human Rights University Program” Human Rights Review 12, no. 4 (2011).